Avery Ruzicka is the force behind Manresa Bread, the celebrated bakery in Los Gatos, California. 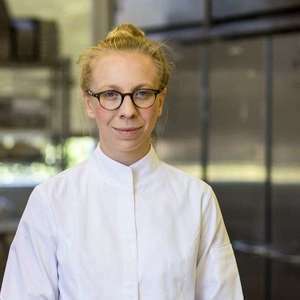 She studied politics, international studies, and creative writing at college in North Carolina, but her interest in food led her to culinary school in New York City. She focused on bread baking and after graduation worked with master baker Ben Hershberger at Per Se. She first crossed paths with Manresa Chef David Kinch as a student and eventually made her way out west to work at his celebrated restaurant. But there was a catch. The only job available was a front of house gig, so she worked as a runner and helped out in the kitchen when she could. Eventually, Avery began baking for Manresa full time and put together the restaurant’s bread program. Manresa Bread officially launched in March 2013 at several farmers’ markets in the area. The bakery opened its doors in January 2015 and regulars line up for the sourdough baguettes, football-sized loaves of levain, chocolate brioche, and almond croissants lovingly baked by Avery and her team.